I presented each part individually (not packaged) because the Pebble Beach Resorts I will be booking directly through them and I am not sure if they will bundle air and car rental as well. Keep in mind that the flight prices change daily until booked. 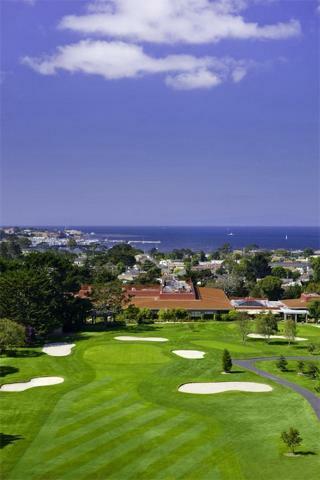 Unique location adjacent to the renowned Pebble Beach Company’s Del Monte Golf Course. Resort Fee of $22.00/night assessed and paid directly to the hotel. Complimentary shuttle from Monterey Airport. Conde Nast's 2011 Readers' Choice -- was listed as one of the Unites States Top Small Hotels. Guests receive complimentary use of a golf cart with their golf reservations. Courtesy shuttles are available to transport guests between The Resorts and the golf courses. From Monterey Peninsula Airport, it's a 15 minute drive. Scenic View rooms are located on our upper level floors, affording a partial ocean view, as well as a view of The Links at Spanish Bay and the beautiful Del Monte Forest. Each approximately 460 sq. ft. room features a gas-burning fireplace and a marble bathroom. From Monterey Peninsula Airport, it's a 15 minute drive. 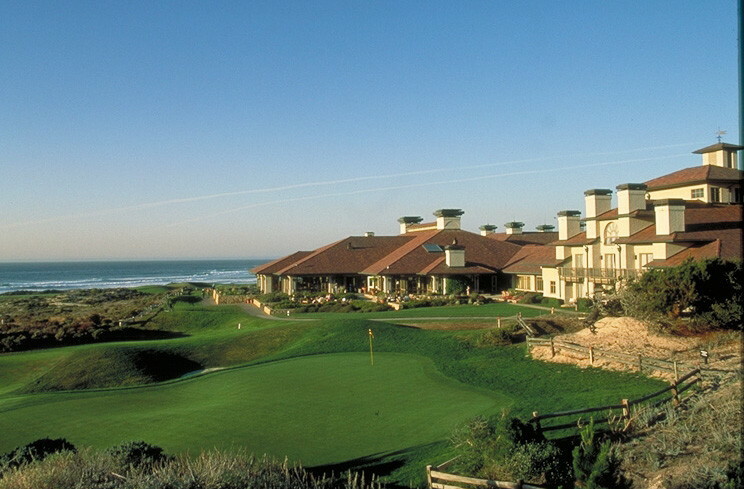 Guests of The Lodge at Pebble Beach and The Inn at Spanish Bay may book up to 18 months in advance. Guests of Casa Palmero may book up to 12 months in advance, subject to availability. recommend booking early to avoid disappointment. 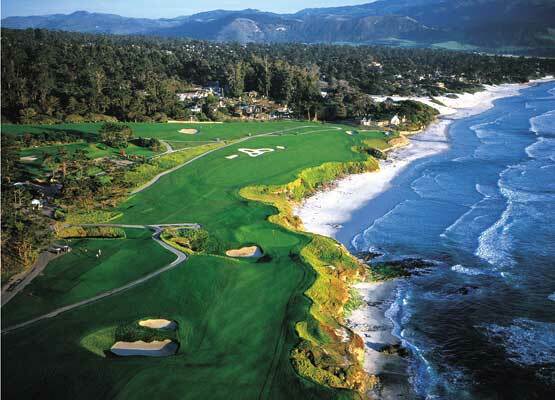 A minimum 2-night stay is required to play Pebble Beach Golf Links. Please inquire about minimum stay requirements for playing multiple rounds. Non-Resort guests may book The Links at Spanish Bay or Del Monte Golf Course up to 6 months in advance, Spyglass Hill Golf Course up to 1 month in advance, and Pebble Beach Golf Links 1 day in advance. Two night minimum stay is required for a weekend stay. Spyglass Hill Golf Course and one inland locale, Del Monte Golf Course in Monterey. The Inn at Spanish Bay is approximately 7 miles away (10 minutes by car). What airports are convenient to Pebble Beach? There are several. 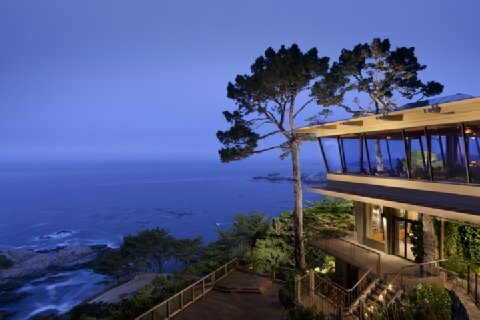 Here on the Peninsula, 20 minutes from the Pebble Beach Resorts is Monterey Peninsula Airport. Most large carriers have flights into Monterey. In addition, San Jose International Airport is about 90 minutes north, while San Francisco International Airport is about 2 hours north. 17-Mile Drive is widely recognized as one of the most scenic drives in the world. The famous coastal landmark runs through Pacific Grove to Pebble Beach, from the dramatic Pacific coastline to the majestic Del Monte Forest. Marvel at some of nature’s treasures found along 17-Mile Drive including The Lone Cypress – one of California’s best-known landmarks – Spanish Bay, Cypress Point Lookout and Carmel Bay. You can also see the emerald fairways of The Links at Spanish Bay, Spyglass Hill, and the world-renowned Pebble Beach Golf Links.